There is a new team in town. Well, a new football club. Soccer, that is. They are FC Davis, and have been playing for the last few months at Aggie Stadium, on the UC Davis campus. We have been to a few games already, starting with the 1-1 draw against the East Bay Stompers (yes, Stompers), who had one tall player that had a big bush of hair and scored a penalty (you can see him below). Many fans were making reference to him being the Lion King because of his mane, which I think he seemed to enjoy, especially when he scored; he was definitely their main player. Lots of the people attending I recognized from AYSO, being a soccer coach myself, and while it wasn’t a big crowd it was a fun, local atmosphere. The kids of course just loved rolling down the grass verges behind the goals, that’s what you do when you are 9 and 10. It was a bit confusing having the field play on an American Football gridiron – the soccer field was laid out in barely visible yellow marking, much wider than the football lines, and on one occasion at least a player took a throw-in from the wrong place. I was expecting a Mexican wave to start on the other side of the stadium, one bloke to stand up, then another person thirty seats away, and another even further, but it didn’t happen. The sun went down, and it got quite chilly, and the game ended in a 1-1 draw (or ‘tie’ as they prefer to say here). The next time I went they totally went and won for the first time at home. They played Napa 1839 (who very sensibly have a wine bottle as their badge; I wonder if their nicknames is The Bottlers? I don’t know but I already have a slew of potential headlines about them, if ever I have to sub-edit their match reports for a tabloid paper: ‘Napa Caught Napping’, etc and so on, I’m sure there are lots of good wine and bottle ones, ‘Napa bottle their opener’ if they lose their first game for example) (many apologies to Napa for this by the way, got nothing against you, it’s just these headlines would work really well in the British gutter press). 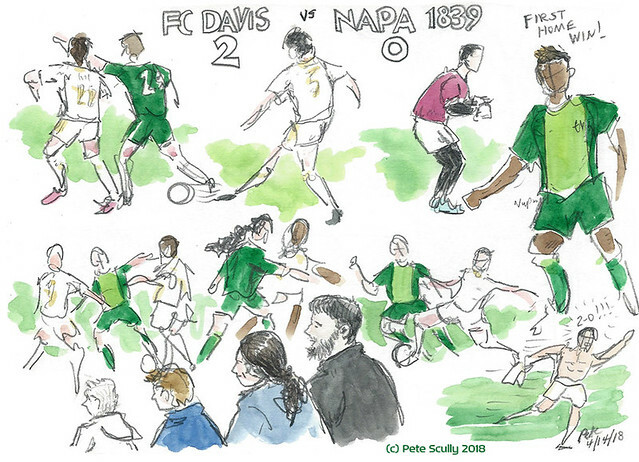 So FC Davis won this one (there’s no way they’d get me to write match reports, I go off on more tangents than the Argentine midfield), and Napa sported a two-tone green outfit. It was a close contest, but when FC Davis scored the winner the goalscorer took his shirt off to celebrate with the roaring crowd. The third and most recent game we went to was against FC Academica. I kept saying it didn’t matter what the score was, “it was academic”, but nobody seemed to hear me. This was a good game. Academica were pretty tough, and took a commanding 3-0 lead. 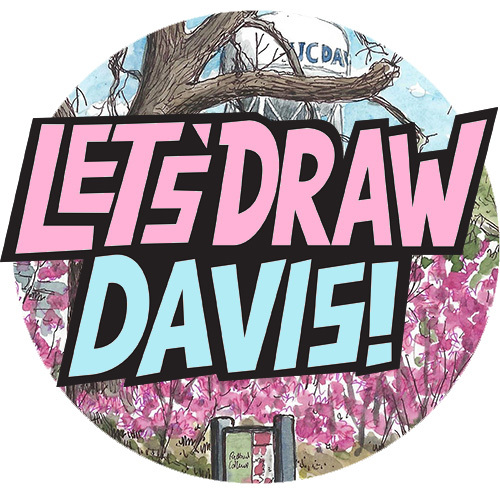 But as it turns out, FC Davis have a a lot of lion’s courage in them, because they came in the last 20 minutes back to tie it up to 3-3, and really should have won 4-3 but had a free kick disallowed (I think VAR would have probably rectified it). It was a very exciting end to the game. I sketched as much of the match as possible (click on the image below to see in more detail). I haven’t had a chance to come to any more games but it was fun sketching them, hanging out with the family and friends and the players on our team, having pizza and beer, and it only cost five bucks to get in. Go Golden Monkey Lion Kings! !